So What is the Digital Workplace, Really? Every industry has its fair share of buzzwords that get thrown around, often to the point of losing all meaning. Whether these are new trends or vague punchy concepts, it can be frustrating to master them, only to have them diminish in relevance and ultimately fade away. Still, some of these terms and ideas are lasting, dynamic, and have a lot to teach us about the current climate of a given industry. Even as they feel like the flavor of the month, they inform on what should be expected and what should be valued in a certain sphere. While some might overuse or misuse these terms, their importance and insight remains. Which bring us to the idea of “the digital workplace.” If your business works with any kind of storage, collaboration, or communications tech, you’ve probably seen the phrase thrown around. 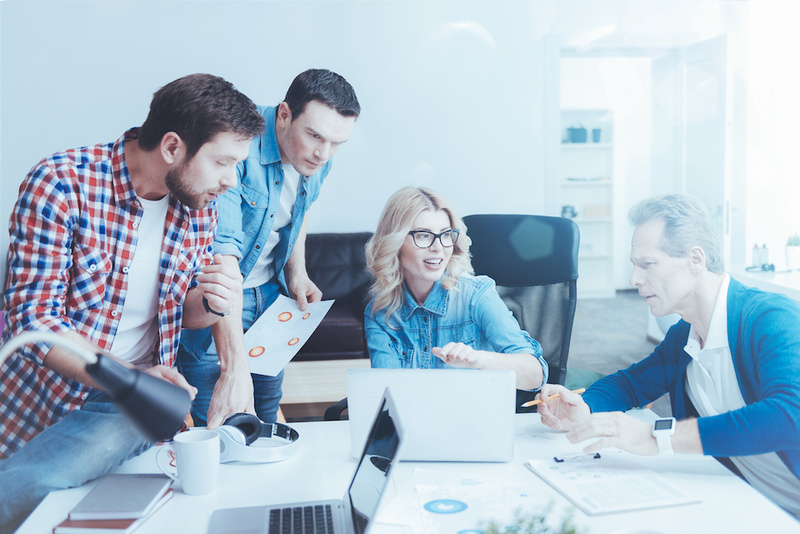 For cloud storage providers and workflow innovators, the digital workplace is their major vision: a seamlessly integrated galaxy of tools and solutions that eliminate the need for traditional analog methods. Still, because the term is so loosely thrown around and so generally abstract, it can feel like more of a marketing slogan than a real visceral concept. For “digital workplace” to lose its meaning like so many other nuggets of thought leadership have, however, would be unfortunate, because the phenomenon it describes is quite real, and has a major impact on individuals across industries. Like so many concepts in technology, there are two different ways to track the history of the digital workplace. The first is to track the history of the term. Who coined in? When did it become truly popular? The second is to understand what the digital workplace actually refers to, and try to track the evolution of the phenomenon itself, even if it pre-dated the name by which it currently goes. Looking at that first method, you can see that in the late 2000s–early 2010s is when the term really started gaining traction. In 2012, Paul Miller published The Digital Workplace: How Technology is Liberating Work. This book–which provides a strong foundational sense of what the digital workplace refers to–posits that the workplace is no longer a physical location, such as an office. Rather it’s the network of data and solutions that businesses use. With the help of new storage and communication tools, the workplace is more or less everywhere, because these tools are allowing users unprecedented access to their content from practically any location. If that’s what the digital workplace refers to, then the digital workplace existed long before anyone thought to call it that. Depending on your approach, you could trace the inception of the digital workplace back to the mid-90s, when email began to gain traction. The introduction of email was transformative, and really started the process of organizations viewing their content not as an item that had to be stored in a drawer or a server, but as something far more ephemeral that was stored without, but consistently accessible from within. What is Your Digital Workplace? Obviously, we’ve come along way since Hotmail pulled up on the scene, and the concept of the digital workplace encompasses a far wider variety of strategies and applications. How businesses craft, sustain, and relate to their own digital workplace is also far less homogenous than it was even 5 years ago. As more and more technologies appear on the market, the options organizations have are much more numerous, and the ways they make use of those technologies far more diverse. For many organizations, that digital workplace is extremely united. Enterprise storage and collaboration suites such as GSuite and Office 365 offer users an amazing variety of tools and features, all of which are centrally integrated, and can be further integrated with third party solutions. This might be viewed as the platonic ideal of the digital workplace as this level of integration means that every piece of content you have and every tool you would need to work with that content are in the cloud. You can edit your files from anywhere, on any device. You can seamlessly leap from a spreadsheet or PowerPoint presentation into a messaging app that intuitively suggests sending that content to team members who might want to look at it. Perhaps one of the best examples of this is Microsoft Flow, which we’ve discussed in a number of pieces on our blog. As a workflow tool, Flow empowers users to automate processes across all of their apps, and to build schedules and strategies that can closely emulate the ways in which an individual user prefers to work. As a feature of the digital workplace, Flow demonstrates what is so exciting about the concept. The days of hard copy calendars, note pads, or mailers is completely eliminated, and even the more recent experience of working with a number of disconnected digital tools is fading away. The other approach to the digital workplace is more piecemeal. It’s the approach of some organizations who opt to have standalone cloud collaboration options, such as Dropbox or Box, but without all the integrations that those vendors can offer. While certain content will be stored in the cloud, a large amount might be stored on servers, more difficult to access remotely. Users will still have access to email and messenger applications, but they won’t be as tied to one another as in the previous example. For many businesses, this strategy can work. Having a wide range of tools provides for more flexibility. While suites are customizable, organizations are ultimately limited by the parameters of the overall solution, and can’t mix and match as easily as those who take a more partial approach. Still, without many of the integrations suites offer, teams and departments expend more energy than necessary on the smaller, more tedious aspects of collaboration. Communication is less fluid, and the need to juggle multiple disconnected tools can be a drain on productivity. Not to mention that businesses buying solutions from a host of different providers when comprehensive suites are available can often lead to unnecessary spending. It can feel a little like buying the body of your car from Dodge, the seats from Toyota, and the steering wheel from Honda. Not only are you probably dropping more money in the process, but the parts won’t go together as smoothly as if you’d simply just bought the whole vehicle from one dealership. Collaboration suites are not perfect either, though! While the range of the tools, and the overall connectivity of these tools can be fantastic, these suites can also be complicated to master, with tools that you may never actually make use of and interfaces that can be initially overwhelming. To stick with the car analogy, some businesses might feel like investing in a suite is the equivalent of buying a sports car when you were initially thinking about a basic sedan. The fact of the matter is, like in most things, businesses have to find the approach that suits their specific needs. No organization functions the exact same, so applying a rigid model of how the digital workplace should look would only end up hurting companies that have different needs than those off which that model was based. Both of the approaches have much to recommend them, and both present challenges should a business go with the wrong option. Whether we like it or not, we’re all in the digital workplace now. The essential step is to figure out how to use that to our benefit: what we enjoy, what previously unmet needs can be resolved, what chances are waiting for us. Working in cloud migration, you become extremely familiar with what the digital workplace looks like for a lot of different businesses, and what changes might be on the horizon. As the amount of data in existence continues to expand at absurd rates, it’s unlikely that the digital workplace–as an element, not a buzzword–isn’t going anywhere, any time soon. The key thing that all organizations must consider in light of that is, how they plan to use this reality to optimize their content, and the experience of working with it. While the nature of the digital workplace feels thoroughly abstract and diffuse, its existence forces enterprises to refocus on the most concrete element of their business: the people. How do your users like to work? What challenges are your users facing? What tools have your users found that they seemed to enjoy? Answering these questions will help you understand what your organization’s future look like in an increasingly digital world. It will help you make decisions that allow everyone within your company to thrive–decisions far more exciting and impactful than whether it’s worth it to go with a new open office plan.